Officials of the Chinese Communist Party (CCP) have arrested four priests of the underground Catholic Church for refusing to join the state-controlled Catholic Patriotic Association. 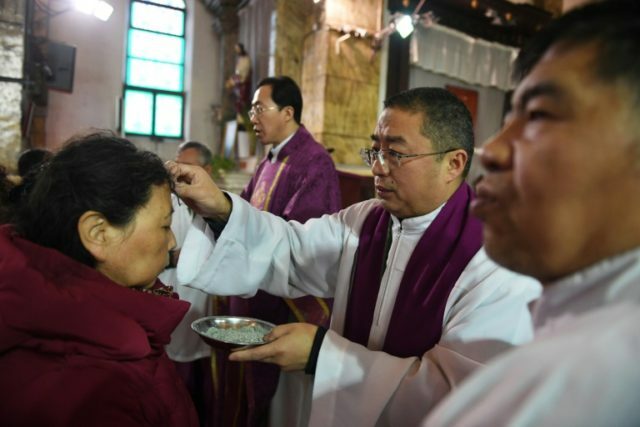 In recent days, police removed two priests of the Diocese of Xiwanzi — Fr. Zhang Guilin and Fr. Wang Zhong — and two more from the diocese of Xuanhua — Fr. Su Guipeng and Fr. Zhao He — in order to subject them to “indoctrination,” according to AsiaNews, the official press agency of the Pontifical Institute for Foreign Missions. In September, the Vatican signed a deal with the Communist party ceding to the officially atheist government an unspecified amount of control over the naming of Catholic bishops, ostensibly in an effort to unite all Chinese Catholics and make the underground Church superfluous. In the wake of the September 22 accord, Chinese authorities have demolished two Catholic pilgrimage sites dedicated to the Virgin Mary and stepped up their crusade to remove the symbol of the cross from Christian churches in the country. AsiaNews said that officials tore down the Marian shrine in Dongergou in the name of “Sinicization,” because according to government officials, there were “too many crosses” and “too many holy paintings,” making the sanctuary unacceptable to standards set by the Communist party. Chinese president Xi Jinping has made the “Sinicization” of religion — assimilating it into Chinese socialism and purifying it of foreign influence — a hallmark of his policy toward religious practice. The Sinicization campaign began last February, with the publication of strict new regulations on religious activities. Since then, authorities have destroyed churches, crosses, paintings, and other Christian symbols, beginning in Henan, Xinjiang, and Inner Mongolia and spreading to Zhejiang, Jiangxi, and other provinces. Ever since China and the Vatican signed their accord on the appointment of bishops, “the Patriotic Association and the United Front have been waging a campaign” to remind all priests that the Church in China is independent from Rome and thus all underground priests are obliged to join the Patriotic Association, AsiaNews said. The pace of destruction of Christian symbols has likewise increased since the signing of the China-Vatican agreement, AsiaNews said. Media reported in October that officials had forcibly removed a cross from a church in Zhumadian Diocese in Henan province on October 3; demolished the cross at Lingkun St. Michael Church of Yongqiang Parish in Zhejiang province on October 11; and removed two more crosses at Luoyang Catholic Church in Henan the following day. Part of the Vatican’s concession to the Chinese government to obtain the deal involved the rehabilitation of seven illicitly ordained bishops of the state-controlled Catholic Patriotic Association and the removal of two bishops of the underground church that have been faithful to Rome. Surely, Pope Francis could have found a way “to have a meaningful relationship with the Chinese-appointed bishops without picking sides between his flock and those who’ve viciously opposed it for so long,” he said. “I’m also afraid that clever leaders in China will use this deal with the Vatican to distract the world from their resurgent, egregious mistreatment of other religious communities,” he said.